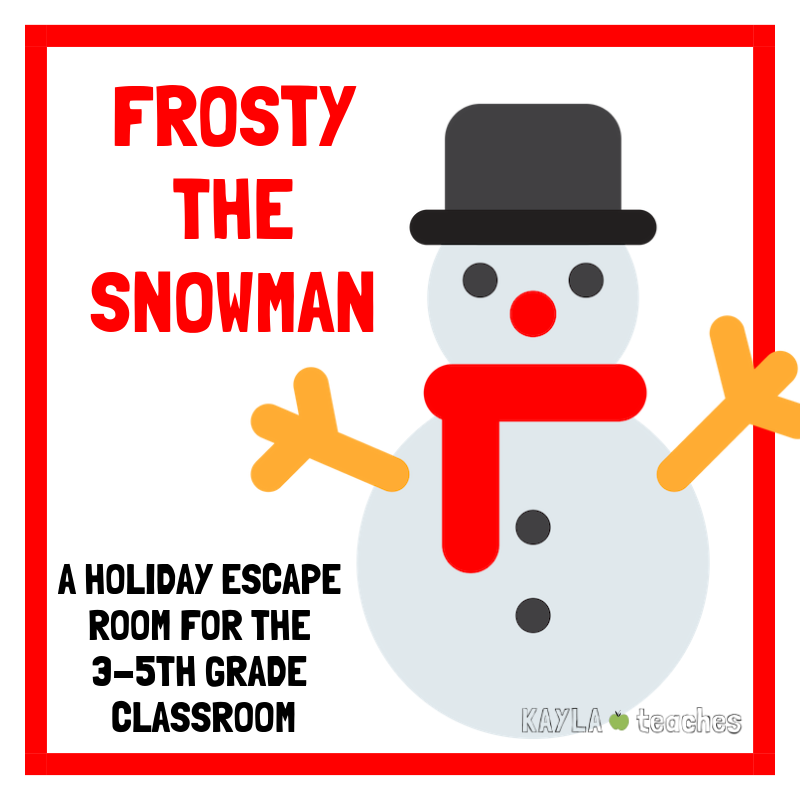 I recently jumped on the classroom escape room bandwagon and tried to make my very own holiday escape room with a Frosty the Snowman theme. I thought I’d share some of my experience because I had a lot of fun and so did my students! First of all, I have done several escape rooms. I think that’s important here because if you’ve never done an escape room it will be very difficult to create one on your own. My hubby and I did our first escape room in Budapest in 2015 and we absolutely loved it. This was before they were very popular in the U.S. Now, we try to do a couple a year because we find them to be so much fun. I knew this would be for a celebration activity just before winter break, so I chose my theme at the very start. I thought that would make it easier as I started my planning. I decided instead of my students trying to “escape,” (how disastrous could that be?) that Frosty’s nose would be missing. This way, their task was to find the nose. From there, I started to think about the type of tasks I wanted my students to complete. For example, I wanted there to be at least one math-heavy task. I also had found a fun cipher called pigpen that I wanted to use. I figured I needed at least one more task to fill out the activity, so I decided to make a sequencing activity out of the song. Now, all of this is completely meaningless unless you have some locks and boxes to facilitate the hunt. I tried to keep my life simple by use just two lockable boxes (I found some really inexpensive “tool boxes” at the dollar store) and two programmable 3-digit locks like these. I started out by reading them a note from Frosty that explained the situation. Then, I gave students the first envelope with clues directly. They had to find a 3-digit number to unlock a box for the second clue. Same for the third clue. Finally, the third clue, once deciphered, explained where Frosty’s nose was hidden. I wasn’t really sure how long this all would take the students to figure out. I had a 45 minute block of time to facilitate the activity. One group finished probably between 25-35 minutes, way ahead of the rest. The rest finished right at 40-50 minutes. Mind you, this included the time it took for me to explain the activity and read the note from Frosty. As far as facilitating multiple groups goes, this part was a bit of a trick. In a normal escape room you can usually have a group of 2-8 or so playing at the same time. However, I needed to accommodate 20-30 kids, so I had to bend the parameters. I set up groups of 3-4 students. Each group had their own set of clues, labeled by colors (red group, etc.). When the game started I gave them the first clue, labeled with their color. Then, when they opened the boxes later, they had to find the clue that went with their group color. As far as ending the escape room, there were two options. I tried them both with two different groups of students. In option A, every group’s final cipher led to a different hiding place with Frosty’s nose. In this version, each group got to complete the escape room. In option B, every group’s final cipher was exactly the same and my students raced to finish the escape room first. This ended things a bit sooner, closer to 35 minutes. Here’s a look at my final product, if you’re interested. I’m hoping to make more in the future, but for now, I’m exhausted! Ha! Overall, I’m thrilled with how everything turned out. My students loved it so much, we’re making our own escape rooms in math class right now! Hopefully I’ll be able to make another one for the students to enjoy before the end of the year. Good luck finding Frosty’s nose!